Andromedas bloom in early May and are one of the first evergreens of the spring to bloom. Although there are many varieties of Andromeda, the Mountain Fire is certainly one of the most spectacular. With its white tassel-cluster type flowers and its fire red new foliage it’s a real eye catcher in the landscape. It’s a zone 5 plant so on the south side of a fence or home it should do just fine. Mountain Fire’s grow to 8-10’ with a 6-8’ spread so leave some space for it to grow, you’ll be thankful for it later on and so will it. 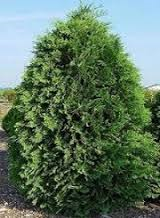 The Mission Arborvitae, also known as a “Techny Arb,” has many uses around your yard. It can be planted in mass as a hedge for privacy. It can be planted on the north side of a property to cut the cold northern winds in the winter time. It can also be trimmed up some in late fall or early winter to add some fragrant greens to a wreath or table. It’s a zone 3 plant that likes full sun but will do fine in partial shade as well. It can be shaped as desired but looks best in its natural state. Mission Arbs grow to 10-15’ with an 6-8’ spread. It’s 10-15’ height will give a nice privacy screen height with out blocking the sun out of a yard all together. Forsythia ‘NH Gold’ was originally hybridized in Claremont, NH. It’s that bright yellow spot you see early in the spring on the edge of the property. When you just can’t stand winter anymore and the ground hog says 6 more weeks, you can go out and clip 10 or 12 branches from any forsythia put them in some water in a sunny window and you will have an early spring in the house. It’s a zone 3 plant that likes full or partial sun. It will spread quickly so the outer edge of the property works well. NH Gold will grow to 5-6’ and spread the same. When a branch tip reaches the ground it will root to form a new plant so be careful to prune regularly. Mt. Fire’s grow to 8-10’ with a 6-8’ spread so leave some space for it to grow, you’ll be thankful for it later on and so will it. Azalea canadense ‘Rhodora’ is a deciduous azalea that blooms very early in the spring. It’s bright purple flowers are usually showing as the tulips and daffodils are poking up. It’s flowers show up before the leaves do. It’s a zone 2 plant that likes full/partial sun so it will do fine with 3 plus hours of sun a day. 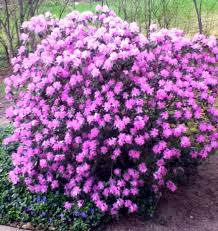 Azalea canadense ‘Rhodora’ is a vase shaped plant that grows to 3-4’ high by 3-4’ in width.